Comments: The Scottsville Brick Company was once located on Snowden's low grounds, and just across the James River from Scottsville. Snowden's long frontage along the James River contained rich siliceous sand which produced superior quality bricks. The initial company, Scottsville Sand and Silica Co., Inc. was formed on February 21, 1920, and, later that year on December 27th, it was reincorporated as Scottsville Brick Co., Inc. The Scottsville Brick Company was not located in Scottsville, but sat on the low grounds of Snowden. The farm lay on the south side of the James River, at the northern tip of Buckingham County. Once connected by Scotts' Ferry, today the two spots are linked by Highway 20 and a bridge. Though there is no remaining evidence of the plant's precise location, it probably sat about three-quarters of a mile along an extension of Valley Street, across the river, through the apex of the James River's Horseshoe Bend. During the 1740s and 1750s, Snowden was assembled through purchase and patent by Peter Jefferson. In 1776, it was inherited by his son, Randolph Jefferson, and in the mid-1820s, purchased out of Jefferson's estate by Capt. John Harris of Viewmont. In 1844, the plantation was sold out of Capt. Harris' estate to his grand-nephew, John L. Harris of Nelson County. Circa 1870, it was bought from his estate by another Harris descendant, John Schulyer Moon. A very valuable farm, Snowden had continued to produce crops for over 150 years. The next generation, however, would exploit the property in a new way. They looked to the rich siliceous sand which lined Snowden's long frontage on the James River. The initial company, Scottsville Sand and Silica Co., Inc. was formed on February 21, 1920, and, later that year on December 27th, it was reincorporated as Scottsville Brick Co., Inc. The officers and directors were John S. Martin, President; John L. Pitts, Vice-President; Frank Carlton Moon, Second Vice-President; George Tyler Goodwin, General Manager and Secretary. Martin also acted as Assistant Manager and Treasurer. Despite these different surnames, the Scottsville Brick Company was very much a family business. Attorney Frank C. Moon (1860-1925) was the son of John Schuyler Moon (1823-1876), former owner of Snowden. George Tyler Goodwin was married to John S. Moon's daughter, Lizzie L. Moon. And, Jacob Luther Moon (John S. Moon's younger brother) was married to John Staples Martin's sister, Ann Staples Martin. John S. Martin (1858-1933) and George Tyler Goodwin (1871-1944) were also partners in a Scottsville real estate business. John L. Pitts appears to be the odd man out and is not known to be related to the Harris-Moon family. He is likely John L. Pitts, Sr. (1863-1924). A partner in Pitts and Morris Company, a railroad construction business, he served on the Albemarle County Board of Supervisors, representing Scottsville District. In 1920, the Richmond Times-Dispatch called John L. Pitts a "prominent financier." The Pitts' home, Belle Haven Farm, overlooked Scottsville and the James River; eventually, a garage was added, built with the company's yellowish-grey brick. Martin was the idea man and the individual usually associated with the company. His patents included: "Brick for Making Structures Fireproof" (1901), "strong and durable" brick tile (1903), "combined brick and tile" (1904), "flashing brick" (1926), and "Multifix brick" (1927). Moon and the Goodwins provided the river front acreage. Lizzie (Moon) Goodwin owned about 280 acres located on the eastern side of the Horseshoe Bend. In 1920, her brother, Frank C. Moon, still owned at least 215 acres closer to the bridge connecting Snowden and Scottsville; indications are that the manufacturing plant was built on Moon's land. During the previous decade, the town of Scottsville had desired new industry. A lengthy headline in the Richmond Times-Dispatch, published on April 11, 1909, announced "Scottsville Wants New Industries And It Is One of the Best Locations for Them. Road Material In Great Abundance. Local Capital Ready to Take Pot Luck With Outside Cash. An Old-Time Canal Town That Has Taken on New Life." Specifically, author Frank S. Woodson named the "magnificent silica mine" owned by Jackson Beal as an example of the new industries locating to the area. In January of 1914, brothers William S. and Jackson Beal were operating the Pure Silica Company, silica quarries about a mile from Scottsville, which may have been an expansion of Jackson Beal's previous mine. The Richmond Times-Dispatch reported, "Large buildings are being erected, and the machinery will be installed at an early date. 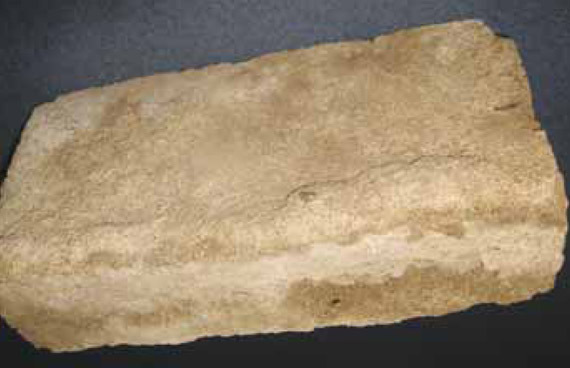 The deposit of practically pure silica is pronounced by experts as being inexhaustible." In 1920, Martin, Pitts, Moon, and Goodwin followed suit. Within a week of the incorporation of Scottsville Sand and Silica Co., Inc., the Richmond Times-Dispatch ran a blurb entitled, "Silica Made Valuable: Scottsville Brick Makers Have Found a Good Thing - Buckingham Sand Goes Into Concrete:"
SCOTTSVILLE, VA. Feb. 26 - Machinery for the new brick-making plant of the Scottsville Sand and Silica Company was shipped Monday from Columbus, Ohio and the company is pushing construction of buildings in which it is to be placed. The company, which is composed of local capitalists owns just across the James River from Scottsville in Buckingham County a vast deposit of siliceous sand, which has been proved of Superior quality for the making of concrete product. It has for several months been operating a small plant, in an experimental way, and results have been so satisfactory that the new plant, with capacity for making 30,000 bricks a day, was ordered. It is the intention soon to engage in the manufacture of roofing material as well as bricks. The June 1920 issue of Concrete Products repeated, almost verbatim, "Silica Made Valuable," adding that the new plant was nearing completion. Perhaps, the company name changed when the company stopped "experimenting" with concrete formulas and the new plant started producing in earnest. Presumably, the company began making brick by the autumn of 1920. At the very least, a few buildings in Scottsville made use of the bricks, though proof of how many and when they were constructed has proved elusive. In the summer of 1924, a deed between G. T. Goodwin, Commissioner, F. L. Holt, and F. C. Moon was recorded in Buckingham County. Holt paid Goodwin $17,500.00 for 215 acres of Moon's land at Snowden Farm. Described as "All of the low grounds and false banks portion ... lying below the present public road which runs from the bridge across James River at Scottsville," one tract contained 120 acres. On the second, adjacent tract, consisting of 95 acres, the brick company had a water reservoir which was fed by a spring from the hills in the small bottom. A survey accompanied the deed; unfortunately, it does not indicate the site of the brick factory. 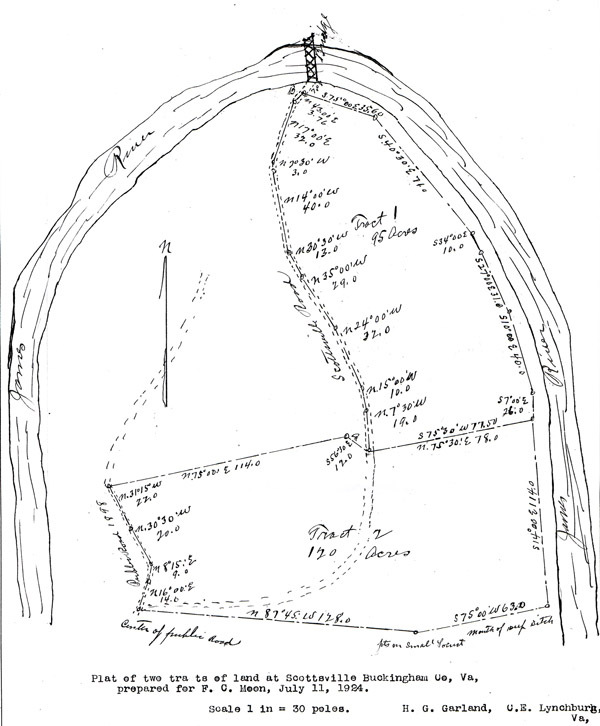 Buckingham County survey of the Snowden land that Frank S. Moon sold to Frank L. Holt in 1924. In the same document, Moon conveyed his rights and royalties in the Scottsville Brick Company (accruing after June 21, 1924), retaining his shares of stock. Moon's sale apparently raised monies to pay personal debts, not debts incurred by the company. Previously, Virginia-born Frank L. Holt had worked in Kingsport, Tennessee, as a construction contractor, an indication as to why he might be interested in the brick manufacturing company. Frank C. Moon may or may not have been ill at the time he sold to Holt; however, within six months, Moon was dead. The company's precise dates of operation are unknown. It was still operating when Moon sold to Holt in June of 1924. Significantly, on the 1930 census, the seventy-two-year-old John Staples Martin listed his occupation as brick manufacturer, indicating that the company may have continued manufacturing into the 1930s and supplied bricks for the Depression-era house located on what was once F.C. Moon's tract #1 and today (2013) belongs to Montie Duncan. Why did the company close its doors? Currently, this remains a mystery. Ultimately, the product may have simply proved unpopular. The company's 1921 advertisement in the Scottsville Enterprise was certainly optimistic: "Scottsville Concrete Bricks make beautiful buildings. They last longer - cheaper in the end." Consumers, however, may not have been convinced and the traditional red brick, so ubiquitous in Virginia, won out. For more about Snowden and the Scottsville Brick Company, see Ruth Klippstein's article, "Scottsville Bricks: The Puzzle Remains", which was published in the Scottsville Monthly (June 7, 2013) on pages 8-13.